Ching Wins first Ultimate Waterman Discipline, scores double points. Hawaii’s Baxter, Lenny, Kala in the final mix! Surf News Network, 15 March, 2015. The waka ama discipline of The Ultimate Waterman driven by Subaru was completed with a neck and neck finish determining the race which was finally clinched by Danny Ching (USA) today. 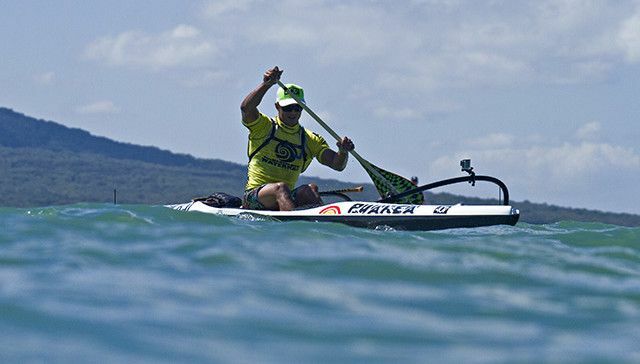 The first discipline of the Ultimate Waterman was a 17km race that stretched from Arkles Bay on the Whangaparaoa Peninsula all the way down to Takapuna Beach. The course rounded the famous Hawaiian Hokule’a Canoe before the athletes ran up the beach to the finish line. Danny Ching finished eighteen seconds ahead of Tahitian Georges Cronsteadt. Ching and Cronsteadt both selected the race as their ‘double whammy’ discipline meaning that they earned double points for this round and both take a healthy early lead in the eight day event. Ching, a professional OC1 canoe racer, commented that the course was super tough with limited chances to take advantage of any small gains against his opponents. “We had wind coming over our left shoulder which is the opposite to what we are used to,” said Ching. “We were basically having to battle up wind for the first half of the race before coming down-wind but what happened is the up-wind was a little easier as we had a little current and push down the coast. Then the down-wind was actually hard, the current was against us and we had a cross wind in our faces making it even more tiring. It really turned into a knock-down, drag-out for all,” he added. Ching finished with a time of 1:23:23, 18 seconds clear of Cronsteadt. “I saw Georges off the line and we separated from the field early. Toward the end I got him on a course change and I am almost positive that gave me the small lead at the end” said Ching of the eighteen second winning margin. Cronsteadt admitted the double points offering gave him extra drive to perform well. “Yes it was a very close race but I think I chose the wrong way, the wrong line, but Danny is strong also. With this discipline being the double whammy, it is why we both tried hard and stayed together and pushed with the lead going back and forth all the way to the finish because it was worth a lot of points to us,” said Cronsteadt. Placing third in the race was Connor Baxter (HAW), nine minutes off the pace but happy to take third and be the first athlete to finish that does not have a strong waka ama background. Baxter led fellow Hawaiian Kai Lenny home and the two were followed by New Zealand competitor Daniel Kereopa. Kereopa was disappointed with his performance after taking an outside line which ended up slower than the race line that other paddlers took closer to shore. “I stuck to a game plan that ended up slightly wrong. I had Mark (Visser) on my tail the whole race so I was under pressure to finish ahead of him” said Kereopa. Visser placed sixth ahead of Manoa Drollet (TAH) in seventh. The eighth competitor Kala Alexander (HAW) is still in transit and is arriving in the country tomorrow (Sunday) after travel delays. Sunday will see The Ultimate Waterman transfer to Auckland’s West Coast at Piha Beach. Athletes will participate in an exhibition with all the watercraft they are using throughout the event. Ching thinks the athletes will be physically exhausted and down in energy after today’s race but ready for the next stage acknowledging that endurance is an important aspect of the week-long event and something each athlete needs to manage well. “Fortunately that was the big discipline for me and I was looking to win that event and get double points. Now that I have that out of the way, I will feel more comfortable with my surfing and it will come a little easier for me. I am looking forward to the exhibition day,” said Ching. The exhibition will also include a display of tandem surfing and foil boarding should conditions suit. Fans of the event will be able to get close and personal with the athletes during an autograph signing session from midday. The exhibition will kick off at 1:00pm. Organisers continue to track Tropical Cyclone Pam and anticipate that the event will head to the East Coast of the North Island on Monday chasing the best possible conditions. Please see below for official results from the waka ama race, the first of six disciplines to be completed for the inaugural Ultimate Waterman driven by Subaru held at Takapuna Beach, Auckland today (Saturday 14th March). Please see below for overall points after one of six disciplines.